OPEN BAR including unlimited beer, wine, water and soft drinks on board! Departing from Sliema strand, we cruise north to the sister island Gozo. We stop at Mgarr Harbour (Gozo’s main harbour) where you will board one of our buses to take a 3 hour sightseeing tour of this beautiful island. During which, you will visit the Inland sea, Fungus Rock, bypassing Ta’ Pinu Church to Victoria (The Capital City) and Citadel (Old Fortified City). 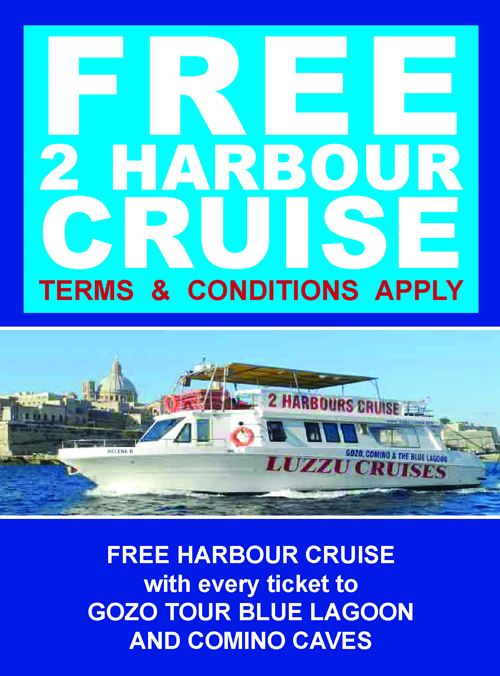 After the Gozo tour, once again you will board the Luzzu Cruises Vessel and proceed to the island of Comino, where we shall stop in the crystal clear waters of the famous Blue Lagoon for approx. 1hr 30min for swimming, sunbathing, snorkeling etc… After our stop at the Blue Lagoon, we visit the Caves of Comino and cruise back to Sliema.